Billy Sheehan says he remains hopeful that the David Lee Roth band will make their abandoned reunion happen – but admits no firm plans are in place. 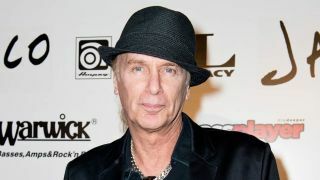 Roth’s planned reunion with the lineup from his debut solo album Eat ‘Em And Smile was set to take place in Hollywood last November, but was pulled at the last minute on safety grounds as the venue was deemed to be overcrowded. Bassist Sheehan was due to perform with vocalist Roth, guitarist Steve Vai and drummer Greg Bissonette and keyboardist Brett Tuggle – as well as Steel Panther vocalist Michael Starr, who they had tapped up to take part while they waited to see if Roth would show. When news that Roth would appear broke, the venue quickly filled and the fire marshall stepped in to shut the event down. In the days after the cancellation, The Winery Dogs and Mr Big bassist Sheehan said it would happen sooner or later. Now he says that although the various members are willing to play together for the first time in 30 years, there are no plan as it stands. Sheehan has also given more detail on the abandoned show, saying the band were less than 60 seconds away from pulling back the curtain and going on stage. He says: “We were ready to go on then we heard something going on outside with the fire department. We offered to pay a fine or whatever, but they would have nothing to do with it. They said it was too full. They had guys in the place with full-on fire gear, helmets and coats.